Last night we went along to the Sussex Yeoman public house. 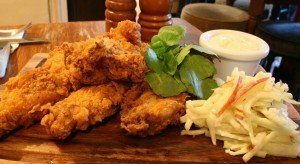 One of those food pubs in Brighton and Hove which has always stood out from the crowd and one with an excellent reputation that has gone back many years. Years ago, the Sussex Yeoman was known for its superb sausages – all home made with their own ingredients and we hear that this particular chef has now relocated to Wales, set up a pig farm and the sausage making business continues! Now the Sussex Yeoman is all about the local ingredients, the quality and the freshness. The scallops were literally delivered yesterday morning for last nights meal and a lot of what you see on the menu has a Sussex footprint. 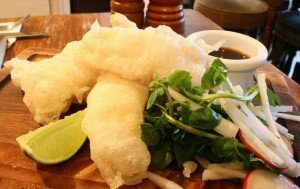 It has also featured strongly as a contender for the ‘Best Food Pub’ at the Brighton Foodie Awards recently, so they must be good. 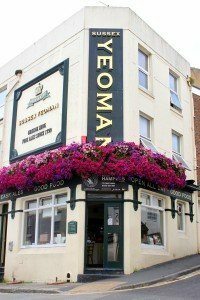 In terms of getting there, it’s a steep walk up from the Brighton station to the Sussex Yeoman – especially if you started at the bottom of Trafalgar Street (we started in Hanover originally)- but as soon as you walk in you’re met by a buzzy pub atmosphere and a friendly smile from the bar staff. I must admit, it did take us a few minutes to fully engage in conversation on entering the venue as we did need to catch our breath after the uphill workout – plus this had created a bit of a thirst! Drink in hand we went to our table and settled in for what was already promising to be a nice evening. Mr RB is doing Tough Mudder in a couple of weeks so we (yes, for some reason I have to train too!) are in training and had done a big run just before we went out to dinner so we had our big apetites on. There is something superb about going into do a food review when your stomach is yearning for food, a feeling we hadn’t encountered before. We were hungry to try the Sussex Yeoman menu. We started with Southern fried chicken wings and blue cheese sauce and Lemon sole tempura. The chicken was good and tasty but the tempura was melt in your mouth lovely and I was a bit sad when my two pieces were gone. This was great finger food and a good way to have a little snack while waiting for the mains to arrive. The two dishes were very well presented, the accompanying sauces were falvour-some and you could taste the freshness of the fish and chicken used. 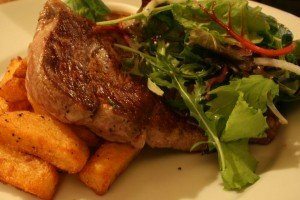 For our main courses Mr RB went for the Sussex rib-eye with fat chips and a side salad and I had scallops with black pudding, bacon and salad. The rib eye is one of the more flavorful cuts of beef, due to the fact it comes from the upper rib cage area, which does not support much of the cow’s weight, nor does it have to work hard or exercise. This quite fatty piece of beef makes the ‘cut’ very good for slow roasting and it also goes well on a grill or in a pan. The ribeye was served with a peppercorn sauce which Mr RB really loved – we asked to find out how it was made and were told that it was made with green peppercorns, brine, cream and brandy. The steak itself was very tasty and succulent. Whenever possible the meat at the Yeoman comes from Natural Farm. This means it is a quality meat, traceable from farm gate to plate, Natural Farms are passionate about animal welfare, their meat is hung for the proper amount of time, they don’t pump water into their meat and they are fair to their farmers. The scallops were very fresh and it turned out that the fisherman who actually brought them – and the rest of the fish – was having them for dinner at the bar. The actual plate of food was well balanced I thought. I didn’t mention the sauteed potatoes earlier but they were nicely cooked and still had their skin on, which I like. 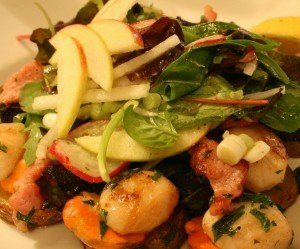 The salad had bits of apple in it which made it tart and a great partner for the black pudding and scallops. 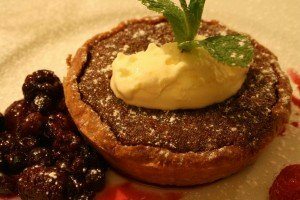 For pudding we shared a treacle tart. Yum! The Sussex Yeoman is very popular with its regulars and I can understand why, plus we understand it is great for local ‘commuters’ who pop in and out on their way to Brighton station. Overall, the atmosphere and the food are excellent and, having checked that dogs are welcome too, I think we might be popping along to try their Sunday lunch soon as we have heard good things here too.